We have had such a wonderful response to Who Speaks For Me? a new co-production with Performance 4A, directed by William Yang and Annette Shun Wah. 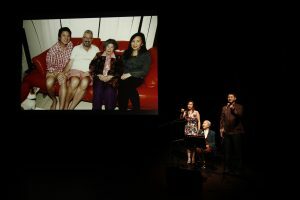 We enter the world of three families in this intimate multi-generational storytelling show, told through personal narratives and photographs. We would like to thank everyone who came to see the show, the creatives and crew for their tireless work on this production and especially the wonderful storytellers for sharing their incredible journeys with us on stage. Who Speaks For Me? season ran at Riverside Theatres from the 12th to 15th October 2016. Production image from Who Speaks For Me?